A Layman's Paper: Pneumatic Effects on Thermohaline Flow | Watts Up With That? Possible links between thermohaline circulation and the ENSO cycle were suggested by Bill Grey as early as the late 1970’s. I became interested in this linkage when I learned Gore and Hansen, (who at that time were not deemed laughable and wielded considerable influence,) urged that Bill Grey’s applications for funding to study the linkage be torpedoed. (“Stick to hurricanes, Bill.”) I decided anything worth going to that length to suppress must be worth investigation. One of the greatest withdrawals from the deep sea’s bank of cold water occurs off the west Coast of South America during La Ninas. This upwelling would seem to necessitate the deep sea’s bank of cold water be replenished in that area, and a deep sea current exist to do the replenishing. Inexplicably, Wikipedia shows no such current, and in fact shows thermohaline currents go to great lengths to avoid the west coast of South America. This further whetted my interest, as I have the cynical belief that, in matters of climate, when Wikipedia states there is no linkage, there probably is a linkage. Besides withdrawals (up-wellings) to the deep sea’s bank of cold water, there must be deposits, (down-wellings,) and these occur in polar regions. Because Antactica is completely surrounded by a circle of howling winds and surging currents, a great deal of mixing occurs, and down-welling is liable to be erratically located and of irregular volumes. A complete and thorough study of Antarctic down-welling would involve vast sums, sturdy equipment, and scientists hot-blooded and insane enough to work in the world’s coldest and roughest waters. As I lack all three of these requirements, for the purposes of this paper I intend to do the scientifically reprehensible thing: I’ll ignore Antarctic down-welling altogether, and focus on the calmer Arctic. My understanding is that, when ice melts, the relatively fresh water floats on top of polar seas. Therefore it can only be during times when ice refreezes that the relatively briney water created is injected downwards into the Thermohaline flow. It is interesting to note that, just when the WHADUP occurs in the Arctic, the La Nina tends to get stronger off the coast of South America. It therefore becomes necessary to invent a mechanism that explains the linkage. The thermohaline circulation itself moves at a snail’s pace. Even if I had the WHADUP speed up the flow, (like a river in flood,) it would take hundreds of years for a WHADUP to reach South America. So I rejected that mechanism. A better idea involved creating a wave in the thermocline. In this scenario the WHADUP would lift the thermocline in the form of a gradual wave. When this wave reached a place where the thermocline was close to the surface, such as the west coast of South America, the uplift of the top of the thermocline would manifest as an upwelling. I still like this idea, but getting the wave around the tip of South America presented problems. Also having a wave in the thermocline, without a reflective wave at the surface, involved moving large amounts of water between the surface and the thermocline, and perhaps even the turbulent destruction of the thermocline itself. Lastly, a wave wasn’t fast enough. I needed something immediate. It was at this point I hit upon the idea of a pneumatic effect. After all, pneumatics allow us to touch our brake pedal, and to immediately have brakes grab in our distant rear wheels. Why couldn’t the WHADUP be like pressure downwards on brakes, and the simultaneous increase in La Nina upwelling be like distant brakes grabbing? The answer, or course, is that a brake line is rigid and the thermocline is not. However I then began to wonder exactly how rigid the thermocline is. To create even an inch-high wave in it, without a reflective wave at the surface, would involve displacing megatons and megatons of water. What if the sheer weight of the water above made the thermocline semi-rigid? Could any pneumatic effect exist? Even if 99.9% of the pneumatic effect was lost, distorting the thermocline, might not 0.1% getting through be enough to increase upwelling off the coast of South America? At this point it became obvious that I needed grant money, in order to study the pneumatics of semi-rigid systems. I needed to build a huge glass tank, and to create an observable “thermocline” by purchasing a vast amount of transparent, yellow oil, which would float above water tinted blue with food coloring. I also needed a large staff of Scandinavian blonds, a new computer, a geek who knew how to run it, and maybe even a scientist or two who could figure out how the heck to inject pneumatic pressure down on one side, and measure if there was any pneumatic change on the far side. But where to get the funding? I figured I might interest George Soros, if I could spin my study to show greater arctic melt meant a greater refreeze, greater WHADUP, and greater La Nina, and that this might “mask” Global Warming. Alas, George Soros sent me no money. I then figured that, with a different spin, I might interest Big Oil, by showing that melting Arctic ice might cause greater La Ninas, and lead to Global Cooling. Alas, Big Oil sent me no money. I had to keep my day job. Take a tube of toothpaste and, when your spouse isn’t looking, squirt at least half of the paste into the trash. In this manner you have created a semi-rigid pneumatic system, a system that lacks the complete rigidity of a brake line. At this point the tube’s skin is a surface that gives with some resistance, like the thermocline. By squeezing at various places on the tube your fingers are like the WHADUP, pressing down megatons of brine. As you press, observe the mouth of the tube, which represents upwelling off the coast of South America. (Don’t forget to remove the cap.) Observe whether a pneumatic effect far away has any effect on the paste at the tube’s mouth. I rest my case. The pneumatic effect of a WHADUP in the Arctic can immediately effect far reaches of the earth, and increase La Ninas. I would like to thank Hansen and Gore for helping me write this paper. If they had not torpedoed Grey’s efforts to study thermohaline circulation and the thermocline with, “Sick to hurricanes, Bill,” papers such as this one could not be written. Only through their tireless efforts to pressure scientists has over a quarter century been spent adjusting, readjusting, and re-readjusting old and stale temperature data, without gaining new and fresh insights and data about mysterious deep-sea depths. Indeed that pressure is more important than pneumatic pressure, for had people said, “Stick to Venus, Hanson,” and “Stick to politics, Gore,” science would be in a totally different state. Short summary: A humorous paper written using a mock-heroic tone of voice and quasi-serious style, intended to poke fun at the current nature of scientific thought, and hopefully to also get people thinking and commenting about thermohaline circulation. LOL, that was the most entertaining climate thingy ive come across in a while! Of course tidal waves work via a similiar principle, where energy is transmitted molecule to molecule, enabling the tsunami to travel at close to the speed of sound across deep water, and it only as the water strats to shallow, the energy is concentrated by the sea floor pushing up concentrating the energy into a wave. Caleb, You must drive a truck with air brakes, most cars these days have hydraulic brakes. The effect that you are surmising would be better summarised as Hydraulic…. But, but, but, there could be pneumatic effects of the changes in atmospheric pressure from the Nino Nina changes reflecting into the deep ocean. You could probably do some simple hydraulic calculations involving the compressibility of water and the amount of downwelling in the arctic and if that could result in a upwelling on the other side of the earth. Just imagine a tube a couple of thousand kilometers long and what would happen if you ad water at one end of the tube. Remember however that at such vast distances compresibility of water and time changes the results. The thing that I notice about this circulation is that it runs all the way up to Greenland on the east coast of America, but it refuses to follow the east coast of China at all. It is almost like there was some strong northward flow in the Atlantic, which is replaced by a southerly flow in the Pacific. What, the sloshing of warm water back and forth between Japan and Peru isn’t enough for you? But you may have a point. If there’s no current off the west coast of SA, the water must be awful stale. also asserts that “One of the “pumps” that helps drive the ocean’s global circulation suddenly switched on again last winter for the first time this decade. The finding surprised scientists who had been wondering if global warming was inhibiting the pump and did not foresee any indications that it would turn back on. Furthermore, “Satellite measurements of sea levels suggest the moon’s tidal pull plays a once-unrecognized role in lifting cold water from the ocean depths and influencing Earth’s climate. Data from the U.S.-French TOPEX/POSEIDON satellite, which bounces radar off the oceans to measure sea levels precisely, also may solve the mystery of what happens to all the energy that the moon transfers to Earth by creating ocean tides. Scientists once thought most of the energy was dissipated by friction as waves and tidal currents drag along shallow coastal sea floors. The new study indicates about three-fourths of the energy indeed is dispersed in that manner. But the measurements also imply 25 percent to 30 percent of the energy in tides dissipates when deep-ocean tidal currents hit seamounts and mid-ocean ridges, creating turbulent “internal waves” that stir and lift cold bottom water so it mixes with warmer, shallower water. That effectively moves heat away from the sea surface, influencing climate in the overlying atmosphere. It is a pity about Dr. Grey, we might know a lot more now. Gore and Hansen have been going at it for much too long now. What you have there is a WASER. The differing density of the circulation versus the surrounding water serves to reflect the pressure wave from the Arctic back into the stream until it pops out as cold water off South America. Don’t blame Wikipedia if they don’t know about the cold current off South America. It isn’t like climate scientists actually get out on the oceans and study what is happening. Much too busy attending taxpayer funded climate modelling conferences, where Real Climate is discussed by Real Scientists. Observation went out of style years ago along with the Dodo bird. Much easier to cook up whatever you want on the computer and twice as accurate. Well, what can I say. Very well written (both understandable, as well as humorous). Thanks for taking the time! (Naturally, though, we all know climate science is settled, as so many things have been in the past). What happened to the Humboldt Current in your illustration? 1. Can I use a computer model of the toothpaste? Or is the experiment only valid using actual toothpaste? 2. If actual toothpaste must be used, is this the purpose of the Scandinavian blondes? To squeezwe the toothpaste? Is there any possible way to substitute Irish red heads with green eyes? 3. If computer models of the toothpaste are used, must the Scandinavian blondes also be computerized models? Or will it be OK to mix actual Scandinavian models with computerized toothpaste models? 4. If both computer models and actual toothpaste are allowed, will there be a nomenclature to identify which branch of investigation is being referenced in any given instance? Say…SBT (Spencer Braswell Toothpaste) or TTT (Travesty Trenberth Toothpaste). 5. What about white paint as a substitute for toothpaste? By painting teeth white, things like cavities and tooth decay can be hidden. HDT (Hide the Decline Toothpaste). Very, very funny Caleb. One more question, this one serious. Ha Ha Ha Ha….I LOVED this and davidmhoffer post, as well!!!!!!!!!!!!!!!!! “Inexplicably, Wikipedia shows no such current, and in fact shows thermohaline currents go to great lengths to avoid the west coast of South America. Brilliant, thanks Caleb. As the Russians say, in every joke a little bit is joke and the rest is true. It is hard to imagine that significant oceanic upwelling such as that off the Peruvian coast does not link directly to the global THC. It is also not hard to understand why the AGW climate establishment would feel the need to sweep the THC under the carpet, since it offers a mechanism for multidecadal and century (even millenial) scale climatic heat budget variation separate from CO2. It is well established that at the heart of ENSO is the intermittent positive feedback between Peruvian upwelling and trade winds that is the Bjerknes feedback. Thus variations in THC can and probably do influence the ENSO. “….Very, very funny Caleb. One more question, this one serious. Blind squirrels do get nuts, on occation. However my usual experience is to come up with an idea that seems brilliant, and to bring it to my older brother, who is a scientist and is far more disciplined, when it comes to scientific thought. He very politely informs me where I am mistaken. I nod, and go back to my day job. However, if I had a new computer and a staff of Scandavavian blonds…. In the thermohaline flow diagram it looks like the stripes in the toothpaste are behaving chaotically. I think you may be onto something here. It would seem to me that if arctic refreezing resulting in downwelling of briny water, then antarctic freezing recently with record high icepack would cause downwelling of briny water there, too. So if we are having a lot of water getting pretty cold and sinking, it stands to reason it should pop up somewhere. But the upwelling is going to be due to trade winds. But it still stands that the upwelled water will have to be replaced by water coming from somewhere. Now that Mr. Shaw has inspired my own frenzied voyage of discovery, my petulant wife is complaining about the “tube” situation. When I ran out of toothpaste, I discovered that most all of the tube-packaged products in her extensive cosmetics collection were equally suitable for my experiments. The woman has no appreciation for the scientific quest. Divining mysteries of the deep can be a lonely business. 2. If actual toothpaste must be used, is this the purpose of the Scandinavian blondes? To squeezwe the toothpaste? I think the Blondes are to squeeze Caleb, not the toothpaste. Your essay is food for thought. A great piece of work. That’s not being cynical. Seems more like experience and healthy skepticism to me. I have never heard that one before, but thinking about it a moment, it seems to support a lot of my observations. The possibility of a solar annual tidal effect as well as a lunar declinational tidal effect, or the interaction of the two being the mechanism for the displacement of the Antarctic down welling current showing up as the surge in the Humboldt upwelling, needs to be considered as a viable alternative. Through experimental work I found that water is very good at finding the most efficient way to shift energy from one place to another in order to maximise heat loss. As the input of energy to the oceans changes in locale and intensity (due mostly to cloud changes), so the flows will change. ENSO is the most obvious perturbation, and it’s average period of around five years possibly matches a half period of interactions between the lunar and solar periods of 9.3 and 10.3-12 year. Independent researcher ‘Bart’ recently found a period of 4.88 years in the impulse response time of cloud to temperature change. There is more in heaven and earth than is dreamp’t of in your philosphy, Trenberth. Brilliant, just needs an in vino veritas peer review component to bring together the diverging currents. Certainly the thermohaline circulation creates downwelling in some locations and upwelling in others. I don’t see any need to go further than that because any other processes which might have the same or a similar effect are likely to be orders of magnitude smaller in their effects and merely local or regional phenomena. It seems entirely plausible that temperature discontinities could develop along the horizontal track of the THC in response to surface warming from reduced albedo and cloudiness which are looking more and more likely to be solar driven in a way that I have suggested elsewhere. So if one has 500 years of increasing solar activity (such as LIA to date) steadily if unevenly imparting more energy to the upper layers I am quite sure that it would feed into the THC to some degree. However the bulk of variability in ocean heat content would occur in the top 700 metres or so because it is so much easier for energy to flow out to the atmosphere than down to the depths. Thus I don’t think it likely that variations in subducted energy are enough to account for a significant portion of Trenberth’s ‘missing heat’. Nevertheless the concept of such subduction and of variations in temperature along the THC is useful for another reason even if the amounts of heat are small compared to the energy exchanges near the surface. The THC takes 1000 years or so for a full circuit so it is highly likely that temperature variations along its track would eventually result in temperature variations when it upwells again 1000 years or so later. Such variations would likely be long and slow and would impose an effect on the energy content of the upper layers independent of whatever was happening near the surface at the time. That leads to the issue of CO2 absorption capabilities of the oceans where slightly warmer upwelling occurs slowly and over a long period of time as a result of solar heating from 1000 years previously. Clearly, absorption capability would be reduced if slightly warmer water is upwelling and that would be superimposed on whatever were to be going on at the surface at the time. Indeed it could well impose just such a persistent stable trend in atmospheric CO2 quantities as that which we currently see at Mauna Loa. I think that is a neat hypothesis that deserves investigation especially if it is now being proposed that any part of near surface warming does get subducted into the deeps by whatever process. The alarmist ideology cannot have it all ways. If they need energy subduction to save their theories about ‘missing heat’ then they can have it but it comes at the price of the potential destruction of their theory for other reasons. Or should that be currants!! I can’t figure out if this guy had got confused about hydraulics vs pneumatics or sumthin. Or where the attempt at humor ends and the serious stuff starts. The time series is too short to support the humorous “4.88” claim. Ongoing laughable misinterpretations of Bart’s “findings” only undermine nonalarmist credibility. Sincerely. Richard Holle, I’m very pleased to see you explicitly acknowledging annual thermal (insolation) tides along with lunisolar tides. The ferocious addiction we see in these discussions to anomaly-based conception has blinded the majority of discussion participants to the strongest temporal mode of terrestrial variability. You might want to have some of your staff take a look at the 850hPa wind maps for each month of the year. I can tell you why such thermohaline circulation and ocean depths research related to globalony will never see the light of coinage. If a current globalonyologist says that the warming is in the pipeline (IE below 1000 meters under the ocean’s surface), there is nothing to say it ain’t there. “Travesty” averted. Green stimulus bucks will not be going to those who could prove them wrong. This all fits with my theory that open water in the Arctic and Antarctic contributes more to global cooling than warming. When I hear that open water absorbs more sunlight than ice/snow covered sea water I say,” what happens when the sun don’t shine?” While open sea water absorbs about two and one half times the amount of sunlight that sea ice does, it also radiates between 10 and 100 times the thermal energy that sea ice does. Up to 1000 watts per sq. meter. When looking at the sea ice around Antartica one notices how it is affected by the wind. Massive amounts are blown north towards the coast of South America, and the rest of the southern ocean. This is first year salty sea ice that will cool the sea water around it, sending it downward. More needs to be said about the effect that open polar sea water has on our planetary atmospheric temperature. The massive open sea is hard to monitor well and doesn’t pay taxes, so has been largely ignored except by fishing boats. How were you able to get unfettered access to the washroom with females in the house? After gaining access, how were you able to find a full toothpaste tube?! Whenever I get to the toothpaste tube it is squished, bent, mutilated beyond recognition. I am always left with the problem of extracting enough toothpaste to cover my brush. It has always been this way. I love false color data plots; they make even subtle differences stand out like a sore thumb. My daily work revolves around false color representations. Sometimes the data is logarithmic, maybe over 15 orders of magnitude; sometimes linear with a few percentage points resolution. Mostly the max value is bright red, and the min is bright blue; but once in a while, I like to use inverted false color. Both are far easier to grasp that grey scale images. So when I see a false color image that goes from faded jadeite, to slightly more faded jadeite, I know that I am looking at data about a pimple on a wrinkle on a sandfly’s rump (arse if you prefer). So I am not too astonished about this “thermohaline” business. I suspect that so long as the earth surface continues to rotate, from west to east, and the land masses; and by inference, the ocean waters, remain in about the same locations, I expect the main currents to keep flowing about the same; and of course behaving according to the usual chaotic river meandering, that accompanies nearly all water flows. If there really is a “thermohaline” effect, why isn’t it colored from red to blue ?? In reading Frijordf Nansen’s “Farthest North” I noticed that their temperature readings found that in the year 1894 the gulf stream heat was monitored as far north as 84.5 degrees and 102 east longitude. This should be worth following up as well. I think that’s probably on the right track. Like waving your hand back and forth in a bathtub at random frequency, you’re likely to get a mix of chaotic waves and occasionally a larger wave. The moon could do something similar. There is definitely a link. I thought about this back in 2007/08 when the La Niña seemed to be coming on strong despite atmospheric elements that were more neutral… the cold water was upwelling like crazy and it took the atmosphere a while to catch on. There’s no way the record ice melt in 2007 and the resulting La Niña didn’t have something to do with eachother. Then look at the super El Niño of 1997/98… it was odd because there was no volcanic eruption like during the strong 1982/83 and 1991/92 Niños. 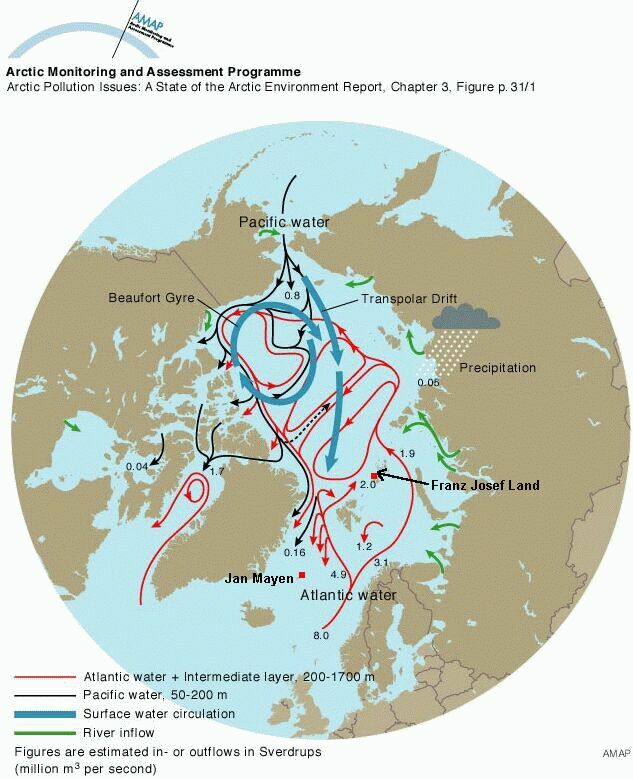 But look at the Arctic in 1996 and 1997. The Arctic sea ice maximum was very low in the spring of 1996. On top of that, the summer minimum was one of the highest since we began recording it with satellites. The result was that a record low amount of ice melted during the summer of 1996. By March/April of 1997 we saw signs of a massive El Niño coming on. Then take a look at more recent El Niños.. these so-called “El Niño modokais”… ice melt was still relatively high, but there was more than just ocean upwelling impacting ENSO. So the result is that the warm water pools into the central equatorial Pacific while there is still some upwelling near South America, keeping waters there cooler. Basically: Low ice melt leads to El Niño by reducing upwelling near South America. Volcanoes and low solar activity also lead to El Niño from an atmospheric perspective as they slow trade winds at the equator. High ice melt increases upwelling… and high solar also leads to stronger trade winds. Of course these aren’t the only players in ENSO, but they are two large pieces of the puzzle. Anyone looking to understand Leroux (1993) should also look very carefully at all months for Vertical Velocity profile. …And don’t stop there. The Heating climatology is also quite revealing, as are others. LeMouel, Blanter, Shnirman, & Courtillot (2010) have straightened us out on where to look for the primary modulation of the annual cycle. Thanks to Erl Happ for pointing me towards that excellent website — a real gold mine for sharpening conceptualization of multidecadal implications of LeMouel, Blanter, Shnirman, & Courtillot (2010). My long day’s done, and it is a real pleasure to sit back and read all the comments. Thanks to all. How can I remember what I never knew? You fellows are teaching me new things all the time, which is why WUWT is such a joy. I can only say that humor is the best way to deal with serious stuff, but Anthony is dealing with very serious stuff on this website. Science has been invaded by politics, and politics will corrupt the Beauty of Science unless people fight for what is beautiful, not with fists, but with minds. The closest politics came to Science was when Churchill thundered, “Never Surrender!” That is the attitude science should have toward falsehood. Politics, on the other hand, allows compromise, allows “I’ll-scratch-your-back-if-you-scratch-mine,” even allows, “The-end-justifies-the-means.” How can politics do anything but pollute Science? That is where I saunter in. I represent Art, in some ways the antithesis of science. I write fiction. Where True Science NEVER makes-things-up, I make-things-up. Hopefully I represent True Art, which cares as deeply for Truth as True Science does. However if you reexamine my “Layman’s Paper,” you should be aware I only resemble a scientist by creating a hypothesis. Then, right where a true scientist would get down to the brass tacks of supporting his hypothesis, I change the subject to Scandinavian Blonds. Tools of the trade. An artist is much like a mind-manipulating con-artist or politician. However hopefully they are not doing it to pick your pocket, like a con-artist, or to gain power, like a politician, but rather for “Art,” which is serious and society-transforming stuff, capable of popping politicians right in the snoot. Science could use all the help it can get these days, and therefore it is important to see that even a non-scientist and artist like myself could be a friend. I really like thinking about scientific stuff, but I’m far more comfortable in the landscape of Hobbits riding the shoulders of Ents in Middle Earth, and consequently I have neglected a lot of things I should have attended to, had I any desire to become an honest and scrupulous scientist. One must accept a certain discipline even in my creative world, (wherein one makes up the truth,) and one has a certain relationship with Truth even when one writes fiction, however science is superior when it comes to imposing limitations on imagination, and demanding truth be objective. The beauty of science lies in the fact it is so strictly honest. Artists, in comparison, are liars. They are always making stuff up. One must then ask, of what earthly use are artists? The discipline of science involves accepting limitations, and one accepted limitation seems to be that events must be replicated, before they are accepted. Life, however, holds much that is never replicated. Every day, in fact, is a once-in-a-lifetime experience, changing our human individuality which is, in and of itself, unique as a snowflake and defiant of replication. In fact, when you really think about it, everything is so unique nothing can be replicated, and science should not exist at all. However science does exist, as a testimony to man’s ability to concentrate Mind amidst chaos. Art, supposedly the antithesis of science, is the exact same thing: A testimony to man’s ability to concentrate Mind amidst chaos. Art just happens to concentrate on a different aspect of life, an aspect which lies outside of scientific replication, but which can be artistically replicated. After all, one sure sign you have succeeded as a creative writer is when others say, “I always thought that, but never found the words to say it.” You have replicated something. For a musician a sure sign of success is when the audience is so “in tune” they are engrossed, enraptured, tapping-their-toes, swaying, on-the-same-page, though in the case of music what is replicated cannot even be put down in words. Even though Science is very different from Art, (because Science never-makes-things-up and Art makes-things-up,) they are very similar because they concentrate on chaos and bring Truth and Beauty out of it. Despite the similarity, I think there needs to be a clear distinction between the two. If Science trespasses into Art then Art becomes mechanical and heartless, and if Art trespasses into Science then Science becomes a lie. I fear Science has indeed become a lie, in the case of Climate Science. People with big hearts are saying, “the end justifies the means,” unaware that when science malfunctions Truth abdicates and chaos reins, and it is not a beautiful sight, nor can a beautiful result be expected. That is why I am so hard on Hansen and Mann. This was an amusing article. Without taking the time to find all the references, it is my recollection that it takes about 2,000 years for the cold Arctic waters to reach the Pacific. What you miss is that it is certainly possible that Arctic variations from 2,000 years ago will have a profound affect on the Pacific today. It is also worth noting that the climate 2,000 years ago was milder than it is today so there were less deposits being made at the time. Since the Earth entered a cooling period 1,500 years ago, it is certainly possible that 500 years from now there will be centuries of extended La Ninas in the Pacific. 1,000 years from now El Nino will show up again in strength, but a few hundred years later I would expect that the real severe La Nina season will arrive. A river has no pneumatic effect downstream and the ocean currents are much the same. The deep ocean currents are most likely floods of cold water that take thousands of years to arrive. Resonance. 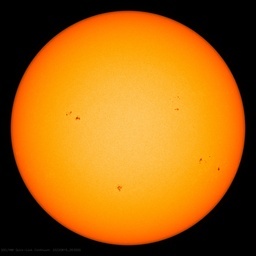 Impressive, the notion of annual solar tides speaks. I can only get the “feel” of such things but I feel that this material would yield results to fast fourier transform analysis. I would expect to see resonances elsewhere too eg seasonal variations to the Gulf Stream. What is “unique” about the South American West Coast? (3) it is in the Southern Hemisphere that holds most of the water of the planet. (4) Earth rotation and Coriolis effect, along a very smooth coastline that just might allow certain resonances to manifest. The ocean currents talked about here are simple to explain using basic physics. The Arctic is a shallow ocean and a radiator of heat. The colder waters created are heavier and denser they go down allowing warmer water to come in on the top. Water by its very nature flows down hill, that is toward the equator following the under sea topography. It is down hill for two reasons, one topography and the second reason is the higher sea level at the equator created by the gravity of the sun and the moon.It is very measurable and could be calculated in advance for variations, giving us another tool for long term weather prediction. Alarmist scientists have ignored the most basic climate drivers and wonder why the heat is missing. Thanks for your “deep thought”. I think it quite profound. Yes, that is what I had in mind, and thanks for all the good links. When I said random, I was just talking about waving your hand around at a random frequency in a bathtub. Of course the moon isn’t random. The effects of the moon on the oceans certainly aren’t random either, merely chaotic. I was just pointing out that in a sufficiently chaotic system, such as ocean movements, you’re bound to get occasional phase alignments in various portions of the system, either canceling or reinforcing some effects.